A man, an Asian worker, reportedly committed suicide on Tuesday in a plunge of 39 floors from a segment of the world’s tallest skyscraper in Dubai..
Dubai Police, Emaar Properties, which owns and manages Burj Khalifa, and a resident, confirmed the report to Emirates 24|7. After he jumped, the man hit the metal barriers of the tower, causing some damage before landing. 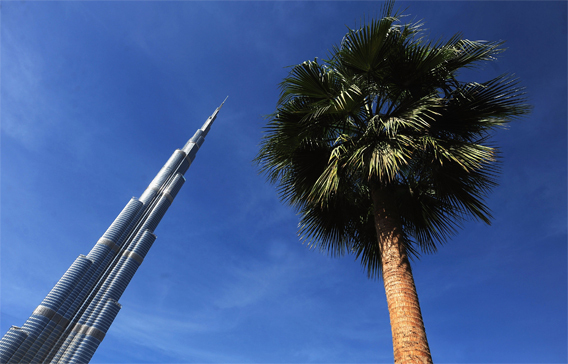 Investigations showed the man worked at a company inside the Burj Khalifa. Police said statements showed that the man had requested a holiday but it was refused. The reports cite security officials as saying that the man fell from the 147th floor of the Burj Khalifa and landed on a deck on the 108th floor. It is the first known suicide from the landmark tower, which opened in January 2010. The man jumped Tuesday morning after leaving a note, said the resident. According to the tower’s owner, Emaar Properties, the half-mile-high skyscraper has 160 habitable stories. An observation deck is located on the 124th floor and a restaurant — billed as the highest in the world — is located just two floors bellow. The 147th floor is a commercial floor and is unoccupied. The tower has balconies on the 76th, 124th and 148th floor. Meanwhile, a source from ‘At the Top’, the restaurant located on the 124th floor of Burj Khalifa said the outlet was closed for maintainence today, but later resumed operations. “The facility was closed for maintainence. However it was reopened after some time,” a receptionist at the Burj Khalifa Tower told Emirates 24|7.